Voice-enabled smart speakers such as Amazon’s fleet of Echo devices (together with their partnerships with other speaker companies hosted on the Alexa voice platform such as Sonos’ One), Google Home, Apple’s soon-to-be released HomePod and Microsoft’s Invoke, are, no doubt about it, making a name for themselves in the speech recognition industry. Similarly, other voice-activated devices such as those controlling your home’s temperature, security and even washing machines have gained in popularity. However what will perhaps be more pervasive in terms of mass, mainstream adoption are voice-enabled mobile applications. In a recent study conducted by Pew Research Center, it was revealed that the vast majority of Americans – 95% – now own a mobile phone of some kind. 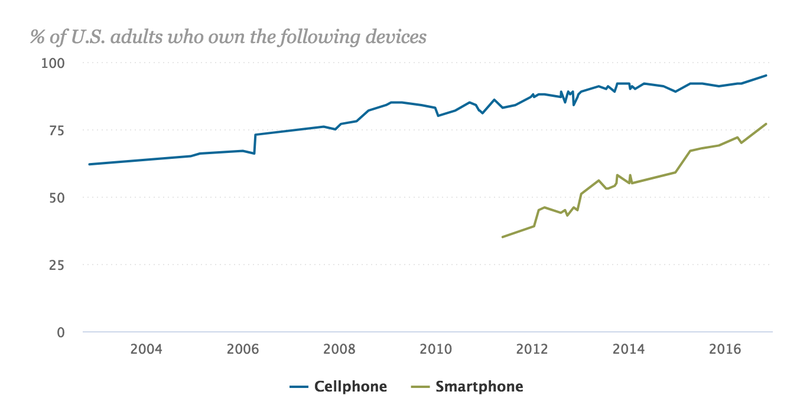 77% of which are smartphone owners, up from just 35% in Pew Research Center’s first survey of smartphone ownership conducted in 2011. In other words, simply downloading a voice-activated app on the smartphone that you already own is less of a commitment and a lower barrier to entry than going out and purchasing, setting up, and learning how to use a whole new device (namely, a smart home speaker). In addition, some people aren’t yet comfortable with the idea of giving voice-activated devices complete access and control over our homes, our cars and workplaces. Mobile app developers have come to a similar conclusion, with thousands making their first foray into the realm of speech recognition. Amazon in particular has jumped in to help make their jobs easier through the introduction of the Amazon Alexa Skills Kit (ASK). ASK allows third-party developers to create apps and tap into the power of Alexa without ever needing native support. With over 30,000 skills and growing, Alexa certainly outperforms Siri, Google Voice and Cortana combined in terms of third-party integration. With the incentive to “Add Voice to Your Big Idea and Reach More Customers” (not to mention the ability to build for free in the cloud “no coding knowledge required”) it’s no wonder that developers are rushing to put content on the Skills platform. Securing themselves as a bonafide platform and go-to leader in the space of speech recognition app development simply being a happy by-product of this decision. With 60 million downloads, over 4 million daily translations and 5 million monthly active users, iTranslate is the world’s leading translation and dictionary app. With a mission to enable travelers, students, business professionals, employers and medical staff to read, write and speak in 100 languages, iTranslate brings us one step closer towards real-time, universal translation and communication across borders. In an effort to help their users avoid those pesky international data costs, the app even comes in an offline mode. Acting as a personal translator in the palm of your hand, the app is available on all iOS devices as well as Android and Windows phones. All you have to do to start a translation (after you have the desired languages selected), is tap and hold. Once you lift your finger off of the screen, the app will automatically detect which language was spoken, process the speech, and speak the translation out-loud as well as providing an on-screen text version. As simple as that, you can translate voice-to-voice. Although it’s still a work in progress – all companies working in speech recognition are battling the ever-persistent challenge of word accuracy rates – it’s certainly heading in the right direction. The Wayne Investigation is a Skill for Amazon Alexa developed by Warner Bros. to help promote Batman v Superman: Dawn of Justice. Combining the speech recognition technology and produced audio assets (namely, compelling music and sound effects), The Wayne Investigation seems almost like an old-timey radio show with a modern technological twist. “Alexa, open The Wayne Investigation” are the five simple words you need to utter to get started. The game models a “decision tree” format, explains Alexa Blogs writer Emily Roberts. “From three starting actions, users can make up to 37 decisions, each taking the user down paths that lead the player to new and iconic Gotham characters and locations before completing the game”. During the first week, the game engaged seven times more (per weekly average) than all other skills combined; earning the top spot for both total time spent engaging with the skill and average time spent per user. We carry our phones with us everywhere we go – from our bedside tables, living rooms, and even to our bathrooms. So, why shouldn’t we venture into the kitchen with it, too? Boasting over 4,000 recipes by real-life chefs and top food bloggers, SideChef will quickly become a staple in your arsenal of kitchen tools. 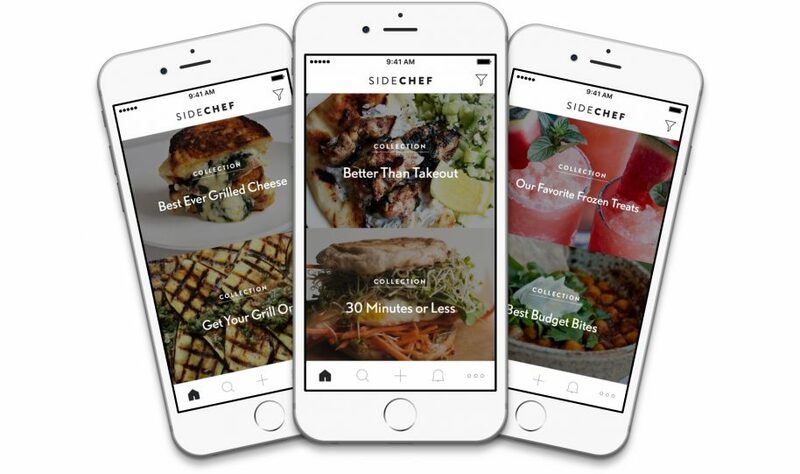 SideChef differentiates itself from traditional cooking and recipe apps by offering narrated voice-guidance to actually read the recipe out loud and step-by-step; allowing the front-and-center chef to keep their hands free and focused on mincing meat, folding dough or stirring sauces. If your hands are covered in the remnants of all the vegetables you just chopped, you can interact with the app using only your voice. Simply say, “next” or “back” to move forwards or backwards a step, and the app will respond. Another one of Amazon Alexa’s Skills, Runescape Quests, provides interactive audio-led adventures. One Piercing Note is the first chapter available through Runescape Quests: a captivating mystery game where the player becomes the voice of a courageous adventurer, tasked with solving a murder. The crime scene investigation soon takes a turn for the unusual as dark, demonic secrets are uncovered in the seemingly serene abbey. Showcasing dramatic voice acting and atmospheric music wrapped in compelling voice-activated gameplay, One Piercing Note is one of the most well-received Skills on Amazon’s ASK platform. Reminiscent of text-based PC games (where you could type in directions, commands and answers to questions navigate through fantastical worlds), Runescape Quests works in the same way – except instead of text, you use your voice. As a player, you’re able to literally speak to other in-game characters (such as merchants) as well as control your characters’ actions by using commands such as, “Pull the lever”. You can also ask Alexa to “stop,” “pause” or “resume gameplay” using voice. Though the game itself has been criticized as having too linear of a story, most others have commented on the games’ ingenuity and await in anticipation for the next chapter to be released. Chicken Scream is different from other games in that the only way to move your character along its journey across dangerous moving landmasses, bridges that collapse after walking on them, and floating spiked balls of doom is by your voice. Stay silent to keep the chicken still, speak to move the chicken forward, and squawk loudly to make it jump. The unique controls offer a nice change of pace from other games you find in the app store, and the removal of “actual” speech recognition (that is, the game doesn’t need to understand and interpret certain words or phrases) means the game can be used by anyone, anywhere around the world; there aren’t any language limitations or barriers for localization here. In fact, we even tested the app using chicken sounds from different languages around the world. A simple but addictive voice-activated Alexa-enabled Skill, Question of the Day by VoicePress.AI posts a new trivia question for you to respond to, from arts and entertainment to literature and science. Just say, “Alexa, ask the Question of the Day” to get started and test (and improve) your cultural literacy. Work your way through multiple-choice answers or give it your best shot with an open-ended question. Regardless, you’re sure to sharpen your skills. PromptSmart is the smart solution to the well aged teleprompter featuring VoiceTrack voice-recognition technology. Simply import your script from your email or the cloud, and customize your prompter with a full suite of options. Including, color, text size, font, guides and more. After pressing play, just start speaking normally and PromptSmart will follow your words in real-time. It will scroll with your natural pace, and will stop when you stop. With no calibration necessary, you can even go off-script without losing your place. The simple, most advanced tool to help your public speaking, PromptSmart is the first-ever voice recognition-enabled teleprompter app. Made exclusively for Alexa-enabled devices, The Baker Street Experience is an interactive audio adventure set in the universe of Sherlock Holmes. Featuring several “environments” that help create a feeling of progression and exploration (including Holmes’ Baker Street study, a busy coffee house and a derelict back alley), this Skill uses full voice-over, including player action prompts and Quit/Cancel functions. The Baker Experience also provides optional visual accompaniment (scene art and help text) to enhance the players’ experience. One of the most important applications to speech recognition technology is in creating hands-free in-car speech systems. Instead of texting while driving, you can now tell your car who to call or what restaurant to navigate to. If the fuel in your car is running low, your in-car speech system can not only inform you that you need to refuel, but also point out the nearest fuel station and ask whether you have a preference for a particular brand. While the creators of MapQuest aren’t quite a full-fledged in-car speech system, their goal to create a safer, more efficient way to drive is the same. MapQuest is a voice-activated GPS that allows you to set a location and receive directions without having to physically interact with your phone. Next to text-to-speech applications, MapQuest is a must-have app for any driver with a smartphone. Whether for utility or for entertainment, voice-activated apps are important for adoption of speech recognition technology. The more we become familiarized with talking to our technology (and sometimes with our technology), the more possibilities for innovation and improvements. We’re already beginning to see more and more use-cases for this technology, as experiments with voice-activated video games come to light as well as speech recognition technology in industries. 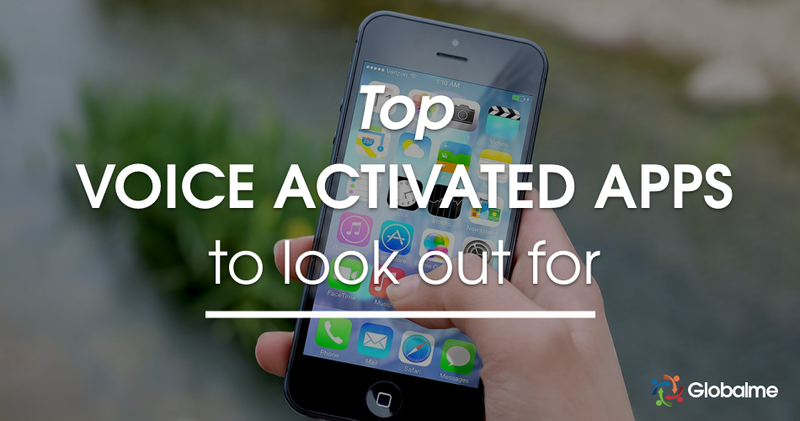 If you have any voice-activated apps on your favorites-list – but not on our list – give us a shout! We’ll be more than happy to add it in.